At Riverstone Advisors, we do the research and share the results with our clients. We keep you informed about what’s happening in the market and potential opportunities for your portfolio. Below are some useful links. Volatility is still present. We revisit the two topics that are driving volatility: pending trade wars and the Fed’s interest rate rises. Volatility is back. We look at the factors that have led to a resurgence in volatility and whether they pose a threat to the economy. Riverstone Advisors publishes this brochure annually to the Securities & Exchange Commission (SEC) with information about the qualifications, policies, and practices of the firm. The contents of this website have been prepared to provide you with general information only. Information provided on this website does not constitute any investment recommendation. In preparing the information, we have not taken into account your objectives, financial situation or needs. Past investment performance is not indicative of future investment performance. The value of investments and the income from them can fall as well as rise and are not guaranteed. Copyright © Riverstone Advisors, LLC 2018. This material is proprietary and may not be reproduced, transferred, or distributed in any form without prior written permission from Riverstone Advisors, LLC. 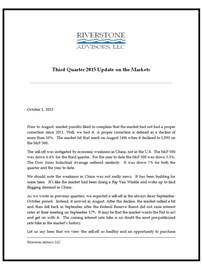 Riverstone Advisors, LLC is a registered investment advisor regulated by the SEC. The attached SEC brochure provides a plain English description of Riverstone’s business. Our team is ready to help you take the next step in realizing your financial goals!